The Bolivarian Revolution is a political process in Venezuela that was led by Venezuelan President Hugo Chávez, the founder of the Fifth Republic Movement and later the United Socialist Party of Venezuela (PSUV). The Bolivarian Revolution is named after Simón Bolívar, an early 19th-century Venezuelan and Latin American revolutionary leader, prominent in the Spanish American wars of independence in achieving the independence of most of northern South America from Spanish rule. According to Chávez and other supporters, the Bolivarian Revolution seeks to build an inter-American coalition to implement Bolivarianism, nationalism and a state-led economy. On his 57th birthday, while announcing that he was being treated for cancer, Chávez announced that he had changed the slogan of the Bolivarian Revolution from "Motherland, socialism, or death" to "Motherland and socialism. We will live, and we will come out victorious". As of 2018, the vast majority of mayoral and gubernatorial offices are held by PSUV candidates, while the opposition Democratic Unity (MUD) coalition won two thirds of parliamentary seats in 2015. Political hostility between the PSUV and MUD have led to several incidents where both pro-government and opposition demonstrations have turned violent, with an estimated 150 dead as a result in 2017. Additionally, there are claims and counterclaims relating to the imprisonment of opposition figures, with the government claiming that their political status neither impedes nor motivates prosecution for the crimes that they have been convicted of, while the opposition claims that these arrests and charges are politically motivated. Since the death of Chavez, the revolution has gone into decline and the political and economic situation in Venezuela has rapidly deteriorated. Simón Bolívar has left a long lasting imprint on Venezuela's history in particular and South America in general. As a military cadet, Hugo Chávez was "a celebrant of the Bolivarian passion story". Chávez relied upon the ideas of Bolívar and on Bolívar as a popular symbol later in his military career as he put together his MBR-200 movement which would become a vehicle for his 1992 coup-attempt. South America in the late 1980s and early 1990s was just recovering from the Latin American debt crisis of the mid-1980s and many governments had adopted austerity and privatization policies to finance International Monetary Fund (IMF) loans. Following the end of the Cold War and the fall of the military dictatorships in Brazil, Argentina, Chile and Uruguay, social movements including labor and indigenous currents opposed the austerity and called for debt forgiveness, sometimes resulting in clashes with the state (see Caracazo and 2000 Ecuadorian coup d'état). It was in this context that Chávez and MBR-200 (as the Fifth Republic Movement) won the 1998 elections and initiated the constituent process that resulted in the Venezuelan Constitution of 1999. 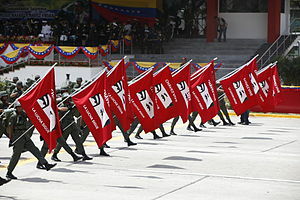 Chavismo policies include nationalization, social welfare programs (Bolivarian missions) and opposition to neoliberalism (particularly the policies of the IMF and the World Bank). According to Hugo Chávez, Venezuelan socialism accepts private property, but this socialism seeks to promote social property too. Chavismo also support participatory democracy and workplace democracy. In January 2007, Chávez proposed to build the communal state, whose main idea is to build self-government institutions like communal councils, communes and communal cities. A few year after Chávez rose to power in 1999, he began implementing a political-strategic plan he called the 'Bolivarian Revolution,' which threatened Latin American peace. Chávez's plan was characterized by a hostile and confrontational posture toward the United States, actions designed to export Chávez's autocratic, socialist model to other countries of the region, and a foreign policy that embroiled Venezuela in international-level conflicts. Chávez was seen as a leader of the "pink tide", a turn towards left-wing governments in Latin American democracies. Analysts have pointed out additional anti-American, populist and authoritarian-leaning traits in those governments. Chávez refocused Venezuelan foreign policy on Latin American economic and social integration by enacting bilateral trade and reciprocal aid agreements, including his so-called "oil diplomacy", making Venezuela more dependent on using oil (its main commodity) and increasing its longterm vulnerability. Though Chávez inspired other movements in Latin America to follow his model of chavismo in an attempt to reshape South America, it was later seen as being erratic and his influence internationally became exaggerated, with the pink tide beginning to subside in 2009. The social programs (called "missions" in Venezuela) that came into being during the term of Hugo Chávez sought to reduce social disparities and were funded in large part by oil revenues. The sustainability and design of the welfare programs have been both praised and criticized. Specific examples of social programs are listed below. Plan Bolívar 2000 was the first of the Bolivarian Missions enacted under of administration of Venezuelan President Hugo Chávez. According to the United States Department of State, Chávez wanted to "send the message that the military was not a force of popular repression, but rather a force for development and security". The United States State Department also commented that this happened "only 23 days after his inauguration" and that he wanted to show his closest supporters "that he had not forgotten them". The plan involved around 40,000 Venezuelan soldiers engaged in door-to-door anti-poverty activities, including mass vaccinations, food distribution in slum areas and education. Several scandals affected the program as allegations of corruption were formulated against Generals involved in the plan, arguing that significant amounts of money had been diverted. The mission was to provide comprehensive publicly funded health care, dental care and sports training to poor and marginalized communities in Venezuela. Barrio Adentro featured the construction of thousands of iconic two-story medical clinics—consultorios or doctor’s offices—as well as staffing with resident certified medical professionals. Barrio Adentro constitutes an attempt to deliver a de facto form of universal health care, seeking to guarantee access to quality and cradle-to-grave medical attention for all Venezuelan citizens. As of 2006, the staff included 31,439 professionals, technical personnel, and health technicians, of which 15,356 were Cuban doctors and 1,234 Venezuelan doctors. The Latin American branch of the World Health Organization and UNICEF both praised the program. Though positive outcomes have come from the mission, there have been some struggles as well. In July 2007, Douglas León Natera, chairman of the Venezuelan Medical Federation, reported that up to 70% of the modules of Barrio Adentro were either abandoned or were left unfinished. In 2014, residents in Caracas also complained of the service despite large funding from the Venezuelan government. Mission Habitat's goal is the construction of thousands of new housing units for the poor. The program also seeks to develop agreeable and integrated housing zones that make available a full range of social services—from education to healthcare—which likens its vision to that of New Urbanism. According to Venezuela's El Universal, one of the Chávez administration's outstanding weaknesses is the failure to meet its goals of construction of housing. Chávez promised to build 150,000 houses in 2006, but in the first half of the year completed only 24 percent of that target, with 35,000 houses. The Mission involves a state-run company called Mercados de Alimentos, C.A. (MERCAL), which provides subsidised food and basic goods through a nationwide chain of stores. In 2010 Mercal was reported as having 16,600 outlets, "ranging from street-corner shops to huge warehouse stores", in addition to 6,000 soup kitchens. Mercal employs 85,000 workers. In 2006, some 11.36 million Venezuelans benefited from Mercal food programs on a regular basis. At least 14,208 Mission Mercal food distribution sites were spread throughout Venezuela and 4,543 metric tons of food distributed each day. In recent times, customers who had to wait in long lines for discounted products say that there were a lack of products in Mercal stores and that items available at the stores change constantly. Some customers complained about rationing being enforced at Mercal stores due to the lack of products. In some cases, protests have occurred due to the shortages in stores. The program uses volunteers to teach reading, writing and arithmetic to the more than 1.5 million Venezuelan adults who were illiterate prior to Chávez's election to the presidency in 1999. The program is military-civilian in nature and sends soldiers to—among other places—remote and dangerous locales in order to reach the most undereducated, neglected and marginalized adult citizens to give them regular schooling and lessons. On 28 October 2005, Venezuela declared itself a "Territory Free of Illiteracy", having raised in its initial estimates the literacy rate to around 99%, although the statistic was changed to 96%. According to UNESCO standards, a country can be declared "illiteracy-free" if 96% of its population over age 15 can read and write. According to Francisco Rodríguez and Daniel Ortega of IESA, there has been "little evidence" of "statistically distinguishable effect on Venezuelan illiteracy". The Venezuelan government claimed that it had taught 1.5 million Venezuelans to read, but the study found that "only 1.1m were illiterate to begin with" and that the illiteracy reduction of less than 100,000 can be attributed to adults that were elderly and died. David Rosnick and Mark Weisbrot of the Center for Economic and Policy Research responded to these doubts, finding that the data used by Rodríguez and Ortega was too crude a measure since the Household Survey from which it derived was never designed to measure literacy or reading skills and their methods were inappropriate to provide statistical evidence regarding the size of Venezuela's national literacy program. Rodríguez responded to Weisbrot's rebuttal by showing that Weisbrot used biased, distorted data and that the illiteracy argument Weisbrot used showed the exact opposite of what Weisbrot was attempting to convey. There's not much left of the so-called Bolivarian Revolution—a socialist political process that began in 1999, headed by then-President Hugo Chávez. Endless food lines, a severe shortage of basic goods and an annual inflation rate estimated at 160 percent became the standard image of a country long considered a "petrostate." But with the price of oil as low as $35 a barrel recently, it's long been on its way to total collapse. Following the death of Hugo Chávez, his successor Nicolás Maduro faced the consequences of Chávez's policies, with Maduro's approval declining and protests in Venezuela beginning in 2014. The Chávez and Maduro administrations often blamed difficulties that Venezuela faced on foreign intervention in the country's affairs. As of 2016, Bolivarian Venezuela suffered from hyperinflation and a dramatic loss of jobs and income (consumer prices rose 800% and the economy contracted by 19% during 2016), widespread hunger (the "Venezuela's Living Conditions Survey" (ENCOVI) found nearly 75% of the population had lost an average of at least 8.7 kg in weight due to a lack of proper nutrition) and a soaring murder rate (90 people per 100,000 had been murdered in Venezuela in 2015 compared to 5 per 100,000 in the United States according to the Observatory of Venezuelan Violence). To silence critics, the government has conducted widespread arrests and other repression. Since 2014, we have been documenting the violent response of security forces to protests, with beatings and arrests of peaceful demonstrators and even bystanders and torture in detention. The Venezuelan Penal Forum, a nongovernmental group that provides legal assistance to detainees, counts more than 90 people it considers political prisoners. According to the International Policy Digest, "[t]he Bolivarian revolution is a failure not because its ideals were unachievable but because its leaders were as corrupt as those they decry", with the Bolivarian government relying on oil for its economy, essentially suffering from Dutch disease. As a result of the Bolivarian government's policies, Venezuelans suffered from shortages, inflation, crime and other socioeconomic issues, with many Venezuelans resorting to leave their native country to seek a better life elsewhere. Following the Bolivarian Revolution, many wealthy Venezuelans have sought residence in other countries. According to Newsweek, the "Bolivarian diaspora is a reversal of fortune on a massive scale" where the reversal is a comparison to when in the 20th century "Venezuela was a haven for immigrants fleeing Old World repression and intolerance". El Universal explains how the "Bolivarian diaspora" in Venezuela has been caused by the "deterioration of both the economy and the social fabric, rampant crime, uncertainty and lack of hope for a change in leadership in the near future". In 1998, the year Chavez was first elected, only 14 Venezuelans were granted asylum in the United States. In just twelve months in September 1999, 1,086 Venezuelans were granted asylum according to the United States Citizenship and Immigration Services. It has been calculated that from 1998 to 2013 over 1.5 million Venezuelans, between 4% and 6% of the Venezuela's total population, left the country following the Bolivarian Revolution. Many of former Venezuelan citizens studied gave reasons for leaving Venezuela that included lacking of freedom, high levels of insecurity and lacking opportunity in the country. It has also been stated that some parents in Venezuela encourage their children to leave the country in protection of their children due to the insecurities Venezuelans face. This has led to human capital flight occurring in Venezuela. In November 2018, UNHCR (the United Nations High Commissioner for Refugees) and the IOM (International Organization for Migration) said the number of refugees had risen to 3 million, most of which had gone to other Latin American countries and the Caribbean. Bolivarianism was emulated in Bolivia and Ecuador, which experienced crises of political parties. According to a 2017 study, Bolivarianism failed to spread further through Latin America and the Caribbean "in nations where political parties and democratic institutions remained functioning, and where the left and civil society valued democracy, pluralism, and liberal rights due to brutal autocratic experiences". The study also found that "the fear of Bolivarianism also led to a coup against president Zelaya in Honduras". Aspects of Bolivarianism were adapted by the Spanish political party Podemos. ^ Cannon, Barry (2013). Hugo Chávez and the Bolivarian Revolution: Populism and Democracy in a Globalised Age. Manchester University Press. ISBN 978-1847797193. ^ Canelón-Silva, Agrivalca Ramsenia (2014). "Del Estado Comunicador Al Estado De Los Medios. Catorce Años De Hegemonía Comunicacional En Venezuela". Palabra Clave. 17 (4): 1243–78. ^ Rory, Carroll (2014). Comandante : Hugo Chavez's Venezuela. Penguin Books: New York. pp. 182–94. ISBN 978-0143124887. ^ Aponte-Moreno, Marco; Lance Lattig (2012-03-26). "Chavez: Rhetoric Made in Havana". World Policy Journal (Spring 2012). Retrieved 31 May 2012. ^ "Venezuela profile – Timeline". BBC News. 2017-04-26. Retrieved 2017-05-03. ^ "Venezuelan opposition activists march to Leopoldo Lopez' jail". Reuters. 2017-04-28. Retrieved 2017-05-03. ^ Watts, Jonathan; correspondent, Latin America; López, Virginia (2017-05-02). "Venezuela plan to rewrite constitution branded a coup by former regional allies". The Guardian. ISSN 0261-3077. Retrieved 2017-05-03. ^ Sivaramakrishnan, Arvind (6 March 2013). "Hugo Chávez: Death of a socialist". The Hindu. Retrieved 3 February 2014. ^ Salmerón, Víctor (13 June 2012). "Plan Chávez prevé crear 30 mil empresas de propiedad social". El Universal (in Spanish). Retrieved 3 February 2014. ^ "La democracia participativa es un concepto chavista". Correo del Orinoco (in Spanish). 16 November 2013. Retrieved 3 February 2014. ^ Albrecht, Hermann (29 May 2009). "Chavez Calls on Workers to Push for Workplace Democracy in Venezuela". Venezuelanalysis.com. Retrieved 3 February 2014. ^ Azzellini, Dario. "The Communal State: Communal Councils, Communes, and Workplace Democracy". North American Congress on Latin America. Retrieved 3 February 2014. ^ Colmenares, Leopoldo E. G. (February 2016). "Criminal Networks in Venezuela". Military Review. 96 (1): 53–67. ^ a b da Cruz, Jose de Arimateia (2015). "Strategic Insights: From Ideology to Geopolitics: Russian Interests in Latin America". Current Politics and Economics of Russia, Eastern and Central Europe. 30 (1/2): 175–85. ^ Reid, Michael (Sep–Oct 2015). "Obama and Latin America: A Promising Day in the Neighborhood". Foreign Affairs. 94 (5): 45–53. ^ a b Isbester, Katherine (2011). The Paradox of Democracy in Latin America: Ten Country Studies of Division and Resilience. Toronto: University of Toronto Press. p. xiii. ISBN 978-1442601802. ^ "Once Saudi Venezuela, now a 'pink tide' casualty". The Chicago Tribune. 30 June 2016. Retrieved 30 June 2016. ^ Noel, Andrea (29 December 2015). "The Year the 'Pink Tide' Turned: Latin America in 2015". VICE News. Retrieved 30 December 2015. ^ Justo, Marcelo (27 January 2009). "Entre los números y la realidad" (in Spanish). BBC. Retrieved 31 January 2009. ^ Wilpert, Gregory (2003-11-11). "Venezuela's Mission to Fight Poverty". venezuelanalysis.com. Retrieved 20 June 2013. ^ (World Health Organization 2005). ^ Chávez' Government has built 24 percent of scheduled houses. Archived 11 April 2008 at the Wayback Machine El Universal (July 31, 2006). ^ "Datanálisis: Mercal es el lugar preferido para comprar alimentos" (in Spanish). El Universal. 4 May 2006. Retrieved 19 March 2009. ^ "En Mercal hay mucha cola para pocos productos". El TIempo. 1 May 2014. Archived from the original on 27 January 2016. Retrieved 7 May 2014. ^ "Usuarios molestos por venta racionada de alimentos en Pdval y Mercal". El Carabobeno. 26 February 2014. Archived from the original on 8 May 2014. Retrieved 7 May 2014. ^ "#27M Protestan frente a Mercal de Patarata (Fotos)". El Impulso. 27 May 2014. Retrieved 28 May 2014. ^ a b c "Propaganda, not policy". The Economist. 28 February 2008. Retrieved 3 May 2014. ^ "Bolivia declares literacy success". BBC News. 2008-12-21. Retrieved 27 August 2015. ^ Rosnick, David; Weisbrot, Mark (May 2008). ""Illiteracy" Revisited: What Ortega and Rodríguez Read in the Household Survey" (PDF). Center. Center for Economic and Policy Research. Retrieved 27 August 2015. ^ Rodriguez, Francisco. "How Not to Defend the Revolution: Mark Weisbrot and the Misinterpretation of Venezuelan Evidence" (PDF). Wesleyan University. Retrieved 28 August 2015. ^ a b Pachter, Damian (3 September 2016). "Venezuelan Jews Hoping for Economic, Regime Change – Americas". Israel News Haaretz.com. Retrieved 23 September 2016. ^ "Devaluing the Bolivarian revolution". The Economist. 21 June 2014. Retrieved 23 September 2016. ^ a b c Green, Daniel; Hall, Patrick (14 March 2016). "Venezuela in Crisis". International Policy Digest. Retrieved 23 September 2016. ^ "Venezuela 2016 inflation hits 800 percent, GDP shrinks 19 percent: document". Reuters. 2017-01-20. Retrieved 2017-05-01. ^ "Venezuela: 75% of population lost 19 pounds amid crisis". UPI. Retrieved 2017-05-01. ^ "The biggest worry in crisis-ridden Venezuela: crime". Los Angeles Times. 2016-06-06. ISSN 0458-3035. Retrieved 2017-05-01. ^ "Venezuela's Deepening Crisis". Human Rights Watch. 2016-08-08. Retrieved 2017-05-03. ^ a b c Maria Delgado, Antonio (28 August 2014). "Venezuela agobiada por la fuga masiva de cerebros". El Nuevo Herald. Retrieved 28 August 2014. ^ "Number of refugees and migrants from Venezuela reaches 3 million". UNHCR. UNHCR, IOM. 8 November 2018. Retrieved 13 November 2018. ^ a b c d Torre, Carlos de la (2017-04-10). "Hugo Chávez and the diffusion of Bolivarianism". Democratization. 0 (7): 1271–1288. doi:10.1080/13510347.2017.1307825. ISSN 1351-0347. (in Spanish) Gobierno en Línea: Misiones – official government website detailing the Bolivarian Missions. (in Spanish) Instituto Nacional de Estadística – Venezuela's National Institute of Statistics which has web several portals for accessing demographic and economic data.